This baked salmon with a honey mustard glaze and pecan-panko crust takes just 20 minutes to make yet is elegant enough for company. This baked salmon dish takes a total of 20 minutes – 10 minutes to prepare and 10 minutes to cook – yet tastes like something you’d order at a fancy restaurant. It’s perfect for when you have company coming at the end of a long day (and you’re asking yourself, “What was I thinking?”) or on a busy weeknight when you have to hit the kitchen running. Feel free to substitute another type of fish like cod, trout or striped bass, although salmon offsets the pecan panko crust and tangy glaze beautifully. To parents of picky eaters: if your kids are lukewarm on fish, I find that a crunchy coating is the best way to entice them, and you can omit the nuts if need be. A big thank you to my friend Betsy Goldstein for the recipe! Preheat the oven to 450°F and set an oven rack in the middle position. Line a baking sheet with aluminum foil for easy cleanup, and spray with nonstick cooking spray. In a small bowl, whisk together the mustard, melted butter, honey, 1/2 teaspoon salt, and pepper. Set aside. In another small bowl, mix together the panko, pecans, parsley (if using), and remaining 1/4 teaspoon salt. Spoon the honey-mustard mixture evenly over the salmon fillets. (Don't worry if it drips down the sides a little.) Sprinkle the panko-pecan mixture over the glaze, pressing it lightly so it adheres. Make Ahead: The salmon can be glazed, coated with the panko-pecan mixture, and refrigerated up to 3 hours ahead of time. I made this tonight with salmon and pollock. It was delicious! I made the sauce the same as the recipe and kind of eyeballed the panko and parsley…might have used a bit too much as it was a bit mushy but oooh so tasty. I loved the pecans on it. It did taste better with the salmon than with the pollock, as expected. Everything’s gone, so it’s a winner. Will definitely make this again as it is so simple to make and looks and tastes very impressive when done. I made this last week but instead of salmon I used monkfish and it was tasty. I would try it again with salmon but I think the flavors may work better with the taste of salmon. I would suggest being careful on how much panko you put on because I put too much and it was a little mushy. OMG, so easy and elegant . I made it for a dinner party and my guest raved. about it. Only change I made was I cut the Dijon and only used 1 Tblsp. Top crunchy coating is delicious. I served it with a side of farro and Asparagus. Every recipe I have made from your website has come out great and I’m going to order your cookbook ASAP . Thanks Jen . Great recipe! I made this exactly as instructed and it came out perfect. This is one of our go-to recipes on Fridays during the Lenten season. My children (all under the age of 6) eat it without hesitation. We have made this in the oven, but I have also grilled it as well and both ways came out well. I usually serve it with roasted asparagus and mashed potatoes. Like many who have commented, salmon isn’t my first choice when I’m looking for inspiration, but in the interest of eating more fish, I tried this recipe and fell in love with it. Not only is it delicious, but easily prepped ahead, and the ingredients are always on hand in my house. My sister(who I hooked on Once Upon A Cook) and not an enthusiast for salmon is coming for a visit and I’m going to convert her with this recipe, I just know! Delicious recipe. One of my favorites for salmon. Plus its quick and easy too, great for a weeknight. I definitely fall in the salmon hater-camp. But for health reasons I’m trying to find recipes that make fish taste good. I’m not going to say that this recipe made it ‘not salmon’, but it actually made the salmon tastes good. I think it’s the addition of pecans that take it over the top. I don’t really like salmon, but…This is my FAVORITE (actually the only) salmon recipe! I have it on a regular rotation. The only thing I change – the cooking time. It always takes me about 18 minutes to bake it. I’m not sure if it’s because I prefer it more well done? Or if my pieces are bigger? If you’re not a salmon fan, this is one to try. It will convert you! LOVE LOVE LOVE this! I already love salmon on its own but this steps it up to divine. Whenever I make it for company, people ask for the recipe. My new favourite – thanks Jenn! My husband said it looked like a meal in a high end restaurant. I liked this. Didn’t quite love it. The dijon seemed to come through a little too much. I am not really a big fan of salmon, but I know it is good for us, and the crunchy coating definitely makes it more appetizing. It cooked perfectly, and the top browned exactly as it should. I totally agree! My husband loved it and said he was very impressed. I know he meant it because he commented on the meal multiple times! I liked it as well but not love. I think I would cut back in the Dijon or use a different brand. It was a nice change, will make again! Can I use olive oil in the glaze rather than butter/margerine? My family just can’t tolerate butter or any of it’s substitues. I want to try it this weekend. Hi Denise, I haven’t tried this with olive oil. I do think the topping would be a bit runnier, but that it would be doable. Please LMK how it turns out if you try it! Very good. My husband loved it. I have made this recipe twice now because it is just that awesome! It’s easy to prepare on a busy night and it absolutely a fan favorite with my family of 3 teenagers. The flavors are wonderful and it is easy enough that my 15 year old can prepare it if I don’t get home in time to do the prep. It was this recipe that prompted me to buy Jenn’s cookbook! Amazingly easy and extremely tasty! Great recipe! Sooo I am really not a huge fan of salmon, but I am making an effort to start eating better….enter THIS salmon recipe…. IT IS AMAZING!! I have made this one other time before many, many years ago, but I lost the instructions on how to make it. I am beyond thrilled to have found this on your website! I have since made this for my entire family (7) and everyone loves it…even my picky 8 and 10 year olds! This will definitely be in the bi-weekly meal rotation. Thank you!! This salmon is amazing. I love how quick and easy this recipe is. Sure to impress your quest. Doesn’t disappoint. If I’m making this recipe for 12 people, will that impact the cooking time? Hi Michelle, The cooking time depends primarily on the thickness of the fillets, but it’s likely that with that much fish in the oven, it will take longer for it to cook. If you find that the topping is getting too browned before the salmon is cooked to your liking, you can loosely cover the fish with foil. Hope you enjoy! This recipe was SO EASY!! I was literally sitting on my couch looking for what to cook and came across this and within the first sentence and picture I took myself to the grocery store. My dad, who is the pretty harsh critique said that it was a 9/10 (only because it was missing a side… whoops! Lol). Such a simple and tasty recipe! My only suggestion would be is to use less Dijon mustard especially if you’re not a fan. Other than that, HIGHLY recommend. I’ve also cooked Jenn’s pumpkin pie and immediately came back to her website because she has yet to disappoint me! 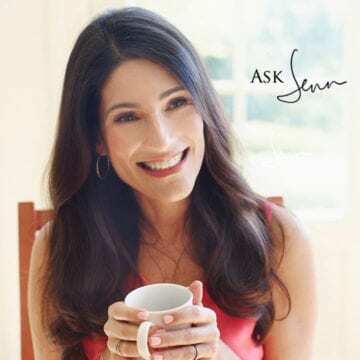 Love Jenn’s recipes! This recipe is awesome. It’s easy to make and is so very elegant at the same time. Has anyone added garlic to this recipe? I have now made this salmon twice, once for my family and once for a “girls night out” at my house. Everyone loves it!! It’s so wonderfully simple, yet elegant and goes with sweet or savory sides. Whether it’s the warm sweet potato salad I served with it last time, or a chopped kale salad w tahini dressing I made my family, it tastes delish with everything! I put it together ahead of time in the frig and just popped it in the oven when my friends and I were getting ready to sit down. So easy! I had to share the recipe with everyone! I love salmon and this is a new and tasty way to make a delicious dinner! My friends were very impressed! I used to not be a big fan of baked fish…until I began making Jenn’s recipes! The salmon in this recipe was chock full of flavor and so moist! I will make again, except next time, I will reduce the amount of mustard since my husband doesn’t particularly like mustard. Thanks, Jenn! This recipe is easy, impressive, and delicious! What I love is you can make it hours ahead of your dinner party and stick it in the oven right before you want to serve dinner. Everyone loved it and asked for the recipe. This was absolutely delicious! I paired it with roasted asparagus and oven-roasted potatoes. Will make this recipe again — so easy to prepare and clean up! I made this dish recently for Rosh Hashanah and it was excellent! It’s a perfect dinner for that holiday as it has some sweetness to it. The tradition for the Rosh Hashanah meal is to serve something sweet as a symbol for a sweet New Year to come. I served this with a baked carrot ring recipe that I have. The carrot ring also has some sweetness to it so it was a nice complement without being too sweet of a meal. 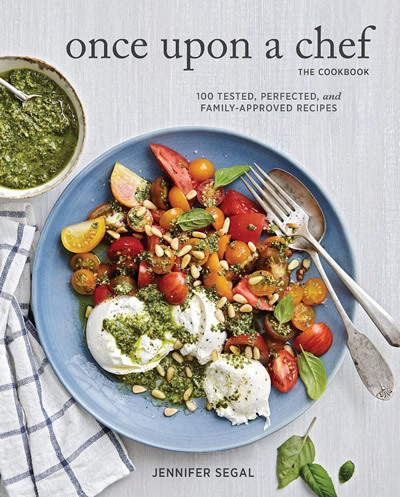 I have recommended Once Upon a Chef to several friends including a Women’s Healthy Cooking Group that I am in here in my neighborhood. It is my new favorite “go to” website. Thank you Jennifer for your wonderful recipes. I made this recipe a few days ago it was easy to follow and turned out really delicious. I loved the combination of mustard and honey it gave the salmon a great flavor. This is sooo yummy. This is the only way I make salmon now. Even my 7 year old niece who would not eat salmon before loves this. I make it just as the recipe says and it turns out perfect every time. The only thing that I have done differently sometimes is if I don’t have any pecans I leave them out and it still is great. Thanks. One of your easy go to salmon recipes of all time! Always turns out moist, crunchy and flavorful. I always use wild Alaskan salmon. When I am hosting many family members that need Gluten Free, I sub out the panko with crushed Milton’s crackers. GF panko is just too hard unlike the regular panko. Hi Barbara, I haven’t tried this with olive oil. I do think the topping would be a bit runnier, but that it would be doable. Great! Simple, delicious and different. This is a wonderful recipe. Everyone in my family loved it! It was easy but super elegant. We’re having neighbors over for dinner in a few weeks and this will be the entree. I tried this last night and it was delicious and I need to tell you that I am not a salmon lover. This was so wonderful with the crunchy Panko and pecans. There were so many wonderful flavors coming through. I felt like I was in a fancy restaurant. I will try this recipe again and again and especially for company. And it is so easy. I made this for lunch today. What a lovely variation for us! We usually buy a huge filet of fresh Steelhead at Costco and grill it on the BBQ. We get about 3 meals off of that per week. Served the salmon on a small bed of fresh baby spinach with roasted sesame dressing and steamed garlic rice. Love all of your food work! What’s the oven setting for the baked panko salmon? Want to try it but not sure of the temperature. Hi Helene, the salmon gets baked at 450°F/230°C. Hope you enjoy! Instead of individual salmon fillets can you use a whole salmon – like what you would buy at Costco? – adjusting the topping and the cook time for the size of the fillet? Sure, Betsy – that’s fine. Enjoy! Next time I’d lower the temperature to 400 and increase the cooking time a little bit. A few of the pecans got a little too dark. Otherwise it was delicious. Could this be cooked on a propane grill with the top closed? In the summer, turning the oven to 450 is a bit much. Sure, Mary – that should work. My family loved this salmon recipe. Mustard was not overpowering. I had one problem- the pecans for the crust were charred. I think I will toast them separately next time and add them after salmon has baked. Hi Ana, The key is to chop the pecans finely. Hope that helps! I can’t believe how simple, fast and tasty this dish is! Even my husband, who doesn’t love fish, really enjoyed it. Will definitely make again. This recipe is also delicious for steelhead trout! I’ve made it several times and it’s even great the next day served cold. Forgot to add that I use maple syrup instead of honey. Delish! This recipe is one of the best “finds” I’ve discovered! It’s easy, delicious, and a great way to dress up a frozen salmon fillet. My almost weekly routine is to roast cauliflower and place our salmon on the end of the roasting pan about 15 minutes before cauliflower is done. One of our favorites!!! Your cookbook arrived last week. I’m anxious to start trying more recipes! Made this for friends today and everyone loved it. “Divine” to quote one of our friends. So easy too. Made it a couple of hours ahead so just had to pop it into the oven. The honey mustard salmon sounds great so I will make it tonight. My question is how large is the tablespoon measure you use in the metric ingredients please? I know the US tablespoon is 15 mills and our Australian one is 20 mills. So far I have used 15 mill size in your fantastic recipes. Can I substitute the pecan with a different nut? My daughter is allergic to pecans and walnuts. Sure, Helen – anything you like. Hi Jen! Can you make this kosher for Passover using a panko substitute? Thank you! Sure, Alana, that should work. I’d love to hear how it turns out! This is my go-to salmon recipe – so good! I make it as is and it is perfect. Unfortunately my newborn has a milk protein allergy so I am cutting all dairy for the next 5 months or so. Do you think I can sub coconut oil for the butter? Any other suggestions? Thank you! Hi Meagan, I do think that coconut oil would work here (and so glad you like it)! Absolutely delicious! Made it twice now and put pistachios the second time. Yummy both ways! I made this dish tonight, and just ate it. It was delicious! I forgot to add the honey, and realized this after the fish had baked. I squirted some honey over the topping and put it back in the oven for 2 mins, and it tasted great! It took about 15 minutes for the fish to cook, (fish about 1.5 inches high), maybe it was too far away from the heat coming from bottom of oven, so after 10 mins, I moved it to a lower rack. Easy to make, delicious! I was surprised by how well the pecans went with the salmon and added an interesting crunch to the flaky salmon. Simple and a weeknight winner! I’ve made this numerous times now since my one son, who doesn’t usually eat salmon, loved this recipe! With a nice brown rice mix, asparagus or broccoli, you have a perfect lean, high protein meal! Given I work, as does, my husband, using this recipe is a quick way to produce a meal that tastes like it took longer than it did to create. Absolutely a ‘go to’ recipe for me, I forwarded it to both of my sisters who also now use it whenever they make salmon. I had a group of 12 ladies coming for dinner. This was perfect. I prepared the salmon 3 hours in advance. I purchased large fillet and cut it into portions. I left the skin on and put it on parchment paper on a sheet pan. Once everyone arrived I baked it for about 15 minutes ( like my salmon cooked through). Could not have been easier to feed a large group. It was a pitch in so the group brought sides and desserts. Everyone raved about how delicious it was. I try to make this recipe every 1-2 weeks, it is nice enough to make for company or just us. It always feels like a special meal when we sit down and enjoy the salmon. This was amazing! Delicious flavor and it melts in your mouth. And even better – it’s easy to make. Highly recommend! I do NOT like salmon at all!!!! Neither does my husband. I’ve cooked it several times, each a different way, and it ended up in the garbage and we called it a pizza night. For this recipe, I had the pizza joint on speed dial. I was all geared up, ready to sink my teeth into a delicious slice of pie! Unfortunately/fortunately, this recipe knocked it out of the park! We LOVED it! So much so, that my husband actually ate 2 pieces in one sitting and I had a slice the next day! I ended up following the recipe as written, except I didn’t add the parsley to the mix. The only “issue” I had (and have had all the times I’ve cooked it) is the cooking time – I’ve always had to cook it for anywhere between 10-15 mins. Maybe it’s because I like my salmon a little more done??? Or maybe I didn’t let mine sit on the counter long enough (too cold from the fridge)??? I’m not sure. But other than that, this recipe is fabulous! I just wish I would have found it earlier! This is now my “go to” salmon recipe. Quick, easy, no unusual ingredients that I won’t have on hand and a restaurant taste and quality. Love all of your recipes, Jen. I am so glad I found this site. This was a quick and delicious weeknight meal. I made it with asparagus and wild rice pilaf. I made extra and had that over a chopped kale and quinoa salad the next day…it tasted just as great the second day as it did the first day. Made it last night. So delicious and easy! Great recipe. I’ve made this salmon many times! It’s delicious and my entire family loves it. I’m trying to minimize dairy in my diet. If substitute olive oil for the butter, would it change the taste and texture much? Love all your recipes! Thanks! Hi Jane, I haven’t tried this with olive oil. I do think the topping would be a bit runnier, but that it would be doable. Quick and easy. The Salmon is so moist. My grandchildren even enjoyed it. This recipe was INCREDIBLY easy, fast and absolutely delicious. I will definitely be making it again- great weeknight option, but would also make it for guests, it was that good!! Would it be okay to pulse whole pecans in food processor? Or should it be done by hand? I have partially dried basil, but no parsley…would that be an acceptable substitute? Sure, P – that’s fine for both. 1. How far in advance can I assemble? 2. Any suggestions in getting the topping a bit brown. I notice one of your reviews they browned the Panko and nuts in butter first. Your thoughts. Sorry for the lengthy question! Hi Cheryl, I think you could assemble this up to a day ahead of time. And excellent idea to toast the panko ahead of time (I probably wouldn’t toast the pecans though, as they could burn if cooked twice.) Hope that helps! This salmon recipe was easy and delicious. I paired by putting over sauteed spinach and shallots (inspired by photo), and serving with a side of leftover roasted potatoes and the best carrots/potatoes/onions I ever had from having cooked over a roasting chicken. Outstanding meal. Would this work with another firm textured fish? I have made this salmon several times and everyone has loved it ! This is a simple yet delicious recipe! Even my kids loved it. Will be making it again soon. I needed a new salmon recipe, and this one melts in your mouth! This will become one of my regular dinner recipes. It’s quick and easy but looks fancy. OMG, I cook salmon frequently but with your few little tweeks it made it a hit ! My husband is not a salmon fan, but he said lets have this again tomorrow ! This preparation of salmon is fast, easy and absolutely delicious! I don’t change a thing. Add a bed of spinach and another vegetable and you’re done. Love it! I recently discovered this website, and I love it. I subscribed to the weekly e-mail, and I love seeing the new recipes each week. This is the first recipe I cooked from the site, and it was easy and delicious. My husband and son asked me to cook it again. I particularly like that this recipe and most others on the site include nutritional information, so I can quickly and easily tell if a dish fits within my nutritional goals. I also like that most reviewers give concrete information about recipes AFTER cooking and eating them. This has become part of our standard weeknight rotation. The kids clean their plates with this dish – tasty and flavorful! It is also quick and easy to assemble, something i need for hectic weeknight dinners. I serve with sautéed spinach and roasted fingerling potatoes. My husband took his first bite and said ‘wow, this is amazing!”. This is a great recipe that I could serve to company or an easy weeknight dinner for the two of us. Jen, thank you for another fabulous dinner! Jen, you’re my go-to recipe blog. I honestly can’t think of one recipe of yours that I don’t like, and trust me I’ve tried a lot. My mom and boyfriend know you by first name because of how often I rave about your site. I made this salmon the other night and it was perfect- easy, tasty, different, loved the crunch of the pecans, and will go in the books for a quick and delicious weeknight dinner to throw together after work. Definitely will try with another type of fish to mix it up. Thank you! This dish is divine! I first tasted it after my Aunt raved about your blog and made this for dinner one night when we were visiting. I have, since, recreated it back home and my husband and toddler devour it. So simple, so different, so delicious! Very easy, I tend to use an instant read thermometer to 125 degrees just to be sure. My son loves pistachios. Would it work to replace the pecans with pistachios? Sure! (Just make sure they’re finely chopped) Hope you enjoy! I made this for dinner for 8 and it was a huge success. Even the non-fish lovers enjoyed it and everyone asked for the recipe! Thanks! I’m looking forward to making this for a small dinner party this Wednesday. I am interested in your suggestions for sides. Perhaps basmati rice, but I am looking for more than plain rice. You warm couscous salad perhaps? Or the grilled baby potatoes with a salad? Also, I have six for dinner so would I follow the recipe and then add half more? Thanks for your help. Hi Karen, this would be nice with plain couscous (or the warm couscous salad) and Sauteed Asparagus and Peas. Also, I have a new feature on the website– for all main dishes, I suggest one or two sides that I think would pair nicely with them. To see what I’ve suggested, scroll to the top of the recipe page and, immediately under the recipe title, you’ll see a bar with several options, one of which says “pair with.” If you click on this, you’ll see the sides I’ve suggested. And your plan for making 1 1/2 times the recipe to serve 6 sounds perfect. Hope everyone enjoys! I cut back on the salt for the glaze otherwise Delicioious !!!!! The only problem with this recipe is that is you might never want salmon any other way. Sooo good, and so simple! A staple in my weekly rotation of recipes. So quick, easy, delicious! Hi Jane, the first line of the instructions indicates that the oven should be preheated to 450°F. Hope you enjoy! I made this last week and it is absolutely marvelous. Amazing. This was a nice change and it made an elegant presentation. I served this with sautéed zucchini, red onion, and basil. I also had left over tuxedo orzo, basil, feta, tomato salad which paired very nicely because the dressing also had honey in it. There wasn’t much chatter at dinnertime. hahaha…. This recipe is fantastic! Something different and it has the perfect combination of tangy and sweet and crunch on each bite. Absolutely delicious and impresses guests. I served this for a nice sit-down dinner I hosted for Mother’s Day and people raved about the fish especially because it was so different from anything they had ever tried. This salmon is delicious and so simple to prepare! It is an impressive dish and I am always asked for the recipe. Great salmon! The two salmon fillets I used weighed just under a pound; after some deliberation, I halved the recipe for the topping and it was plenty. My husband, who generally finds mustard aversive, declared this recipe a winner after just one bite. And it’s so easy to make! We’ll be making this again, frequently. I don’t usually like to bake salmon, but this recipe is easy and quick to prepare AND it’s delicious. It’s both savory and a little sweet, and the chopped pecans give a nice little crust on top. So good! My family loves this salmon recipe. Fabulous recipe…so easy and tasty. My husband is not a fish lover but really enjoyed this recipe. I will definitely make it for company. Yum. So good! I followed the recipe except I did have some almonds to use up and so we subbed the pecans with that. Still amazingly good! I paired this dish with Jasmine rice and the suggestion (of previous reviews) of sautéed spinach. Thank you! This recipe is a treasure! My husband and I knew from our first bites that this salmon would be a new tradition for our family (the first of many attempts at salmon dishes to make the cut!). My only substituons were olive oil for butter and dried dill/herbs de province for the fresh parsley. Thanks a million, Jenn! This is a surprisingly simple and really rather elegant dish. A nice variation is to use crushed pistachios instead of pecans. This was amazing. Moist on the inside and crunchy on the outside. Wonderfully flavorful. I will definitely add this to our favorite list! This recipe was so tasty and easy. The crunchiness of the panko breadcrumbs and sweet mustard glaze complement the salmon perfectly. They look all fancy too! Will definitely be making this again. Enjoyed this recipe very much! It was so quick and easy. I am always on the lookout for delicious salmon recipes. Thanks so much! I made the recipe exactly as written but since our oven wasn’t working, I made it outdoors in our grill, with the hood closed. It came out delicious and moist. A good idea for a hot summer day when you don’t want to turn on your oven. Made this for company exactly stated in recipe and it was FABULOUS. Thank you Jenn. Love your site so much!! My husband and I are trying to eat more fish and I’ve been searching for a recipe for salmon that we really liked. After trying many sauces and cooking techniques, this recipe is the winner! It is so easy to make and the taste is out of this world. The crunch of the crumbs and nuts mixed with the wonderfully complementary taste of the honey mustard with the salmon I think would even appeal to people who don’t normally care for fish. Try it – you won’t be sorry! I tried this with local cod and it was good, but the topping was a little too sweet for such a mild flavored fish. The next time I made it, again with cod, I omitted the honey and substituted crushed sea salt pita chips (any cracker would do) and reserved a little of the butter to toss with the crumb topping so it would brown a little better. It came out great and still easy to prepare. Salmon doesn’t need this extra flavor boost, but cod can tend to be bland without these adjustments. The nuts are a great addition to the topping. Absolutely a keeper. Made it exactly as written except that I had honey mustard so used that instead of, you guessed it, the honey and the mustard. It was scrumptious. This will show up on our table frequently now. This dish was amazing. It tasted like an expensive meal out. Thank you! This was a wonderful dish, as is usual from this website. I made it again with a slight variation that seemed to work well: instead of mixing all of the butter with honey and the mustard, I mixed in about 1/2 tablespoon and then mixed the remaining butter with the topping ingredients. It made the topping crunchy and pretty. I also turned down the temperature to 425 degrees and preheated the pan I used to put the fish on. Thanks for a great recipe! As a fishing charter operator and chef on the north coast of British Columbia I am always looking for new fish recipes to feed my guests. This recipe is a wiinner!!! Thank you. I used Atlantic cod for this and it was very good. My husband said not to mess with it, but for cod, which can be bland, the topping needs a little more oomph. Next time I make it my plan is to reduce the honey, increase the mustard, and saute the panko with a little of the butter before mixing it with the nuts to get a buttery crust. I’ll let you know how it turns out. I would like to make a batch of “Best Ever Biscuits” – could I make them savory and how and what quantities of spices would I use???? Also do you think that I could add bacon bits for a different twist on this biscuits. I’m wanting to make these with a soup and send it to the United Church’s Spring Fling as one of the contributions to the bake table. Hi Sharon, The biscuits are already savory – so no need to add any spices – but I definitely think you could add some bacon bits. Please lmk how they turn out :). Do you have a recipe for Baklava? Unfortunately not, Sheryl– sorry! I’ll have to add it to my list of recipes to potentially develop. Fantastic! Made exactly as specified, served with wild rice & spinach. Family loved it and it was quick & easy to prepare and cook! Saw this yesterday and made it tonight…delicious. We loved the honey mustard glaze and I can see using this on pork or chicken also. Next time, I think I’ll skip the panko as I found it to be a little gritty tasting. I might still sprinkle with ground pecans or almonds for some crunch. THIS WAS ABSOLUTELY DELICIOUS. I SERVED IT WITH SAUTEED SPINACH & FARRO. ALL GOES WELL WITH LEMON. Received this recipe years ago from all.recipes.com and it is excellent. I use 8-ounce center cut salmon filets and bake in pre-heated 400 degree oven for 15 minutes and comes out perfect every time (slightly pink in center) after resting for a few minutes. I make this a lot. Another winner! Simple, healthy and quick. Two thumbs up from my family ? This recipe was amazing! When I saw it, I knew I had to try it. The salmon came out so tender. This was a quick and easy meal for the week. My fillets were thick so they cooked for the whole ten minutes. I loved the crispy topping too. I served it with a bacon and blue cheese salad. I threw some extra pecans in the salad to compliment the flavors. Another great one! Made this tonight. Excellent. Thanks! This looks simple and elegant, can’t wait to try. Do you have a favorite side dish(es) that you would serve with the salmon? Hi Denise, I love it with sautéed spinach (as pictured) but I don’t have a recipe for that on the site. Just quickly sauté spinach with butter and a little garlic. It’s also wonderful with this asparagus and peas dish or puréed cauliflower. As for a starch, rice pilaf is nice. Hope that helps! Is the Salmon pictured with sauteed spinach and can you tell me what grain is in the background. Its helpful to know what to serve it with. Love your recipes, I know I can always count on them being good! Yes, that’s sautéed spinach. I’ll get a recipe up on the site soon for that – meanwhile, simply sauté spinach with a little butter and garlic and season with salt and pepper. And the grain is a wild rice blend. 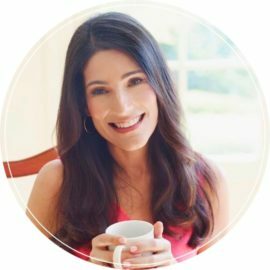 Hope you enjoy it, and glad you’re having success with the recipes :).